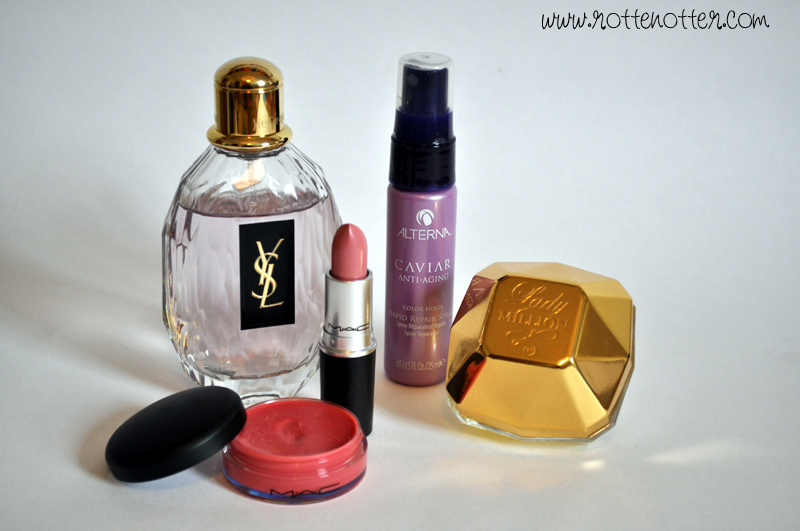 Not too many products in this months favourites post, I seem to be using the same things each month. These are all fairly new products that I bought though. YSL Parisienne Perfume - I was going through my little bottle so quickly I bought this 90ml bottle in duty free when I went to Venice. I still love it as much as when I first bought it and is my daily scent. Alterna Caviar Hair Spray - This was from the first glossy box and I've really been enjoying using it. I'm not sure about the anti-aging claims but it makes my hair feel nice and look more tamed. Paco Rabanne Lady Million Perfume - This has become one of my favourite perfumes of all time! Whenever I wear it I get people asking what it is. It also lasts a really long time too. Once again I've bought the small bottle but can already tell I'm going to get through this so quickly. Mac Tinted Lip Conditioner in Petting Pink - I really love the smell of Mac lip products, they're so nice! I haven't had this long but I've been using it everyday since I got it so thought it still deserved a place in this post. It's such a nice natural colour and keeps my lips feeling and looking soft. Mac Creme Cup Lipstick - Another one that I haven't had long but have worn every day. I can tell I'm going to get through this quickly and I think it's started a bit of an obsession for Mac lipsticks. I have quite a long list already! Creme Cup looks gorgeous, I recently won it in a giveaway, I've been lusting after it for soooo long!